OK, so we couldn’t resist. WFMJ/21 reports that early Wednesday morning, the Youngstown/Warren market NBC affiliate had to cover a fire…and they didn’t have to go far from the station’s headquarters in downtown Youngstown to get to it. In fact, they didn’t have to leave the station at all. An early morning basement fire broke out in the WFMJ building. Nobody was hurt, but the fire damaged a number of systems used in our news and programming operations. The time of the fire, about an hour before the morning “WFMJ Today” news broadcast, prompted some quick thinking by station staffers. So, as pictured here, the morning news team took to the outside of their own building to broadcast live – with a new lead story…their own fire. Alexander told the Vindicator that they were doing diagnostics on other equipment. Of course, the Vindicator owns WFMJ, along with sister digital/cable CW Network outlet WBCB. One wonders what WFMJ would have done if the fire was more extensive. Our condolences to family and friends of former Cleveland radio mainstay Ray Marshall, who passed away over the weekend of a heart attack at the age of 51. Though Ray spent much of the past 16 years at Citadel’s cluster in Lansing MI (as operations manager), his time here in Northeast Ohio was fruitful and long. We’re still trying to fill in all the blanks here, but we know he spent many years as program director of the old “3WE”/WWWE/1100, the station known now as Clear Channel talk WTAM. After what regular reader/OMW tipster Nathan Obral tells us was Ray’s participation in AM 1100’s “final weekend of music programming”, he eventually landed at the old WRMR/850 (today’s WKNR) when it took up standards music. Ray had been “on the beach” in radio terms, after being let go from Citadel in a series of budget cuts earlier this year. In addition to his work running the company’s Lansing on-air operations, he also had a stint overseeing oldies stations for the company, which eventually went on to buy the bulk of ABC’s radio operations. Rubber City Radio country WQMX/94.9 program director Sue Wilson worked with Ray when she was programming AC WDOK/102.1 – at the time, a sister station of WRMR. Sue, and her late husband – WSLR/1350’s Phil Cordle – became good friends with Ray and his wife. Now, here’s a switch that doesn’t happen every day. WKYC/3’s “Director’s Cut Blog” reports that station chief meterologist Mark Nolan is hanging up the umbrella and leaving the weather center. But he’s not leaving 13th and Lakeside – as he moves a few feet over to become co-anchor of the morning “Channel 3 News Today”…filling the position vacated by John Anderson, who just started his new job today on Philadelphia FOX O&O WTXF/29’s morning show. A WKYC release quoted in Frank Macek’s article says Nolan will move to the anchor desk “late next week”, and that sister Gannett station WBIR/Knoxville TN anchor Abby Ham comes to the Digital Broadcast Center to take her place alongside him as co-anchor. Not much really stands out about the below items, or for that matter, connects them. Well, aside from the fact that all the items have to do with persons no longer on the air in Cleveland in 2007 – or are about to leave the area. But it’s Monday, and we’re dragging ourselves back to the grind. MORE ON THE ANDERSON MOVE: The Plain Dealer’s Julie Washington gets around to writing about the departure of WKYC/3 morning co-anchor John Anderson – who left the Gannett Cleveland NBC affiliate a week ago Friday bound for Philadelphia. We’ve already touched on that here, of course. But Ms. Washington fills in some of the blanks we haven’t. For one, she reports that John’s wife, WKYC reporter Kristin Anderson, is expected to remain with the station through the end of the year. Julie also tells us that it was indeed Philly FOX O&O WTXF/29 GM Mike Renda who approached Anderson about the gig there. Renda, of course, knew Anderson from his days helming FOX O&O WJW/8 “FOX 8” here. WHAT’S UP, DOC? : Former Clear Channel oldies WMJI/105.7 “Majic 105.7” staffer Doc Thompson has landed in his talk radio career, again. OMW hears that Thompson, former producer for Majic’s John Lanigan and Jimmy Malone morning drive talk fest and former imaging producer, takes a high profile afternoon drive slot at Clear Channel talk WRVA/1140 in Richmond, VA.
WRVA listeners have voted and the overwhelming winner is Doc Thompson! Doc will join our team on Monday October 29th. Thank you for participating in this very important decision. And thank you for listening to 1140 WRVA. WRVA is another of those Clear Channel 50,000 watt “blowtorch” talk station. On a decent radio, it can actually be heard after sunset in much of Ohio. The Richmond opening happened after incumbent WRVA afternoon driver Mac Watson packed it up for Phoenix, where he airs on Bonneville talk KTAR/92.3 (one of those Bonneville converted-from-AM large market talk outlets). Another former WRVA afternooner, Michael Graham, does mid-mornings on Boston’s WTKK/96.9. Before landing in Virginia’s capital city, Doc had a short stint programming Albuquerque NM startup FM talker KAGM, which we’re told was basically overloaded with high-priced talent – and collapsed under that financial weight not long after it started. AND “GARY DEE”‘S RETURN: In recorded form, of course, since the controversial former WHK/1420 morning drive talk show host has not been alive for some time. His voice, though, returns to his former station’s airwaves Wednesday night at 6 PM, as the Salem talker appropriately schedules a Gary Dee tribute show – “Amen and Hallelujah – The Gary Dee Radio Special” – on Halloween night. Mr. Gilbert certainly scared a few people, not to mention a few bosses, over his years on the air. We’ve known about this for a while, but Ms. Washington’s column provided us with the reminder this time around. She notes that it’s characterized as another part of the station’s year-long 85th Anniversary celebration. Gary Dee did talk radio later in his career at WWWE “3WE”, now Clear Channel talk WTAM/1100. But in our eyes (ears? ), he’s always been associated with his time on WHK in the 1970’s. WHK, we’re reminded, was a country station outside of morning drive. Heck, Gary Dee himself may have played a tune or two, but that’s certainly not why he was there. He was there to poke pointed, sometimes outrageous fun at those in power in Cleveland, and other notable media personalities. His career and personal life certainly hit some bumps – a notable attempt to move his act to Washington DC at an FM country station fell flat inside of six months. And his rocky and rather public marriage to WEWS/5 “Morning Exchange” co-host Liz Richards showed an ugly side of him – one we have trouble forgetting, or forgiving him for, as far as our memory goes. It hasn’t taken long for the new entity known as Media One to make its mark on the former Clear Channel cluster in Ashtabula. After flipping top 40 WZOO/102.5 Edgewood to oldies as “Magic Oldies 102.5”, the company is about to make its second format change – this time on the AM dial. The Ashtabula Star-Beacon’s Robert Lebzelter reports that Media One’s WFUN/970 is dropping its news/talk format, moving to become an all-sports outlet sometime in November. The station’s morning drive news/talk/information show with John Broom will survive the change, for now, but will move to a midday slot of 10 AM-noon. Broom’s former slot will be filled by ESPN Radio’s “Mike and Mike in the Morning”, and ESPN will also take over much of the remaining schedule. But “for now” regarding Broom’s show may be an operative phrase. The Star-Beacon article calls the move “interim”, which to us basically screams “until we find something else to put there”. Broom would presumably remain with the company even if his show on WFUN goes away, as he’s replacing former news person Kathy Davis due to her move to “Magic Oldies”. Afternoon drive will see local sports talk, with a show by Joe “Pigskin” Pete weekdays from 5-7 PM, and a regular remote featuring Pete and co-host Ed Looman from a local restaurant once a week. Disclosure here: We’ve actually heard the rumblings about this one for most of the past week, but were about to confirm them. OMW hears that the changes have even been talked about on Broom’s WFUN show itself, with some dissatisfied listeners expressing their concerns. Why is Media One making the move? We guess that there are two reasons. For one, many of the shows and content being dumped on 970 are syndicated by Clear Channel’s Premiere syndication arm. The takeover of a Clear Channel-owned station doesn’t necessarily mean an automatic end to that company’s shows (Rush Limbaugh, Glenn Beck, etc.) on the new non-CC station, but it may provide a “clean break” to do something else – particularly if the new incoming ownership isn’t 100% attached to a pretty standard Clear Channel small-market talk station schedule. Well, almost standard – at last check, WFUN ran Premiere’s Jim Rome in delay in afternoon drive. We have no word if Rome will survive the transition to a format that would be more compatible with his show. Though sports is often a ratings-challenged format, it sells well – particularly with local advertisers. WFUN carries a healthy dose of sports already, including local events, and we heard even from the start of the Media One era in Ashtabula that the station was planning on beefing up its local sports coverage. 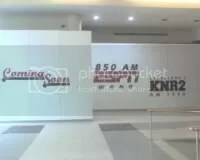 Over the past month or two, we’ve heard references on Good Karma sports WKNR/850 “ESPN 850″‘s mid-morning show with Tony Rizzo about the station’s upcoming studio move to the Galleria in downtown Cleveland. We didn’t know WHEN, though, despite hearing “Rizzo on the Radio” producer/co-host Aaron Goldhammer talk a while back about getting trained on new equipment at the new ‘KNR facility. Since the Rizzo show is our best source of information about some of the internal workings of the sports talk station, it’s no surprise that we heard Mr. Rizzo himself proclaim Wednesday that they were doing the “third-to-last” show at the old Broadview Heights facility. “Rizzo on the Radio” and everything else on ESPN 850 WKNR will move to the Galleria studios on Monday, October 29th. Actually, the “switch” will likely happen sometime Sunday or Sunday night, without fanfare, in the middle of an ESPN Radio network show. And we’re assuming that the local “Sportscenter” updates with Jeff Thomas and Daryl Ruiter will continue to be done from Metro Networks’ facility in the Independence Media Gulch. And though we didn’t hear it, regular OMW reader/tipster Nathan Obral in Lorain County tells us that the WKNR Galleria studios have actually been used already. The station did one of its recent “10th Inning” baseball postgame shows from the Galleria, and we hear that there were still a lot of technical bugs to iron out. Nathan guesses that the postgame show was intended to come from the new studios as a postgame “celebration” for an Indians win – which of course, didn’t come. COLUMBUS MOVES: Within a half-hour of each other, two OMW readers gave us the heads up… the long-awaited move of Clear Channel’s WMRN/106.9 Marion into the Columbus market is about to take place. As a result, beginning November 12th, the country music format that is currently being broadcast on 106.9, will be broadcast on both 106.9 and 94.3…Then, around November 15th, the 106.9 frequency will go off the air. The current adult contemporary format on 94.3 will not be replaced. This was what many speculated would happen, going way back to the days of the initial proposal to move WMRN-FM into Columbus. AC WYNT/95.9 out of Upper Sandusky moved to a new COL of Caledonia OH, putting a much better signal into Marion. Though WYNT is apparently an AC outlet, it uses Clear Channel’s “Majic” branding, most famously used a hundred-and-change miles northeast of Marion at CC oldies outlet WMJI/105.7 in Cleveland. Its presence as a Marion station operated out of the CC cluster there negates the need to keep the “Mix” AC format on 94.3 FM. The other end of the equation? We’re not hearing even rumblings about what might end up on the station when it hits C-bus. Feel free to share those with us. It actually is trivially easy to find both the Cleveland Indians and the Cleveland Cavaliers playing – and winning – games, on local TV. You just have to turn your wall calendar with its face to the wall, and pretend it’s a few months ago. Both Cleveland-based regional sports TV networks are filling much of their schedule in the next week or two with replays of “instant classic” games involving the Indians and Cavaliers. We didn’t watch to the end, but we presume all of these replays will involve a Cleveland team winning at the end. FSN Ohio starts airing games for real soon, as the Cavaliers open up their season on October 31st, aka Halloween night. STO’s Friday and Saturday nights during the month of November will be chock full of the playoff coverage the Cleveland-based network won the rights to carry in a contract with the Ohio High School Athletics Association. As part of the deal, STO will turn to cable partner Time Warner to carry the games in southwest Ohio, where the Indians-associated network has no cable carriage. AND ONE HD UPDATE: As it turns out, Scripps Cleveland ABC affiliate WEWS/5 did not fully launch its high-definition field news video system over the weekend. OMW reported it had been planned to start last Saturday, making “NewsChannel 5” the first local station to do its field, recorded news video in full HD. But we hear from sources at 3001 Euclid that the equipment and editing software showed a few bugs, and is being pulled back until the digital exterminator assures all will be well. And as Raycom Media’s WOIO/19 gets the bugs out of its own presentation of news in high-definition, we noticed that they’ve had to do switching in and out of HD/SD for commercial breaks, though we’re wondering if that’s because the company’s two stations have different HDTV resolutions. WOIO/19, being a CBS affiliate, broadcasts in HD in the 1080i standard. WUAB/43 used to do so with UPN, but had to convert to 720p after picking up the FOX-owned MyNetworkTV. While we’re at the HD races, we hear rumblings that “Cleveland’s CBS 19” may finally have pleased local home theatre owners, with the addition of 5.1 audio.